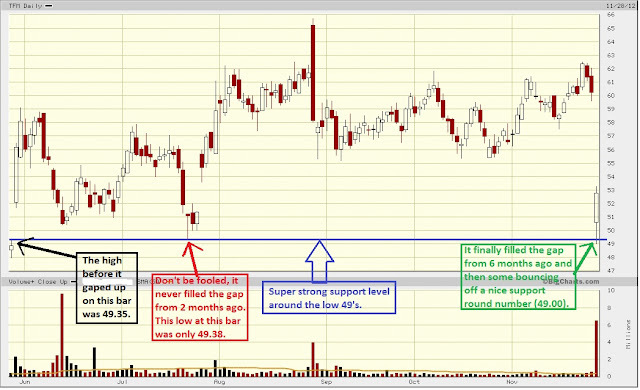 TRADER 9: Trade of the day, TFM!!! TFM had too many probabilities working for it when it bounced off the 49 dollar price at the open. If you click on the picture on the top of here, you can see there was no way it was going to break to lower lows when it touch 49.00 a share and started to trend back up a little right at the open this morning. So I went long at 49.75 hoping for a nice 3-5 points Dead Cat Bounce. I stay very patience with this for a bit during first hour after I got filled because it was really having these big swings for about an hour until it finally stabilized around 10:45a.m ET bouncing off a 50.50 price temporary support level. I moved my stop from 48.95 to 50.40 and just watch the good times roll. 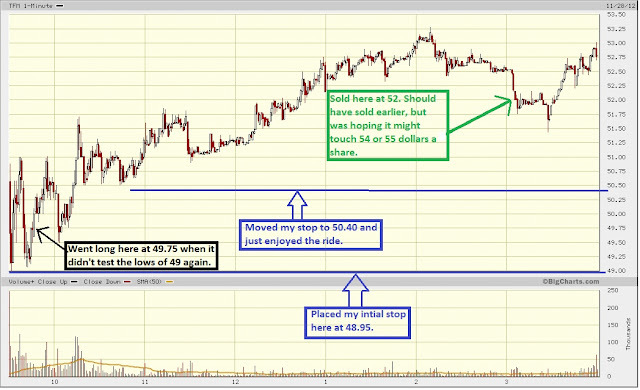 I did get a little greedy holding on longer than I wanted to and got out at 52.00 for a 2.25 point gain.